Social Media + Elections: A Recap | Can social data be used to predict elections? From Jonathan Bright and Scott Hale’s blog post on Twitter Use. In the run-up to the general election we conducted a number of investigations into relative candidate and party use of social media and other online platforms. 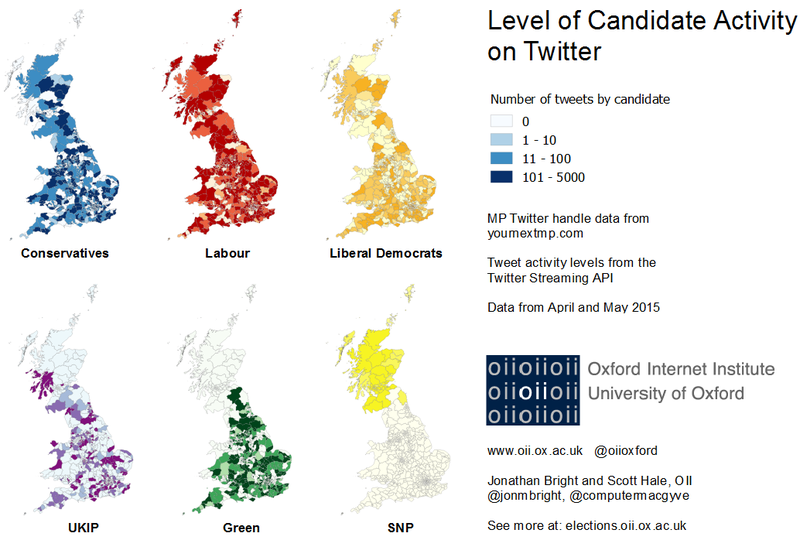 The site elections.oii.ox.ac.uk has served as our hub for elections-related data analysis. There is much to look over, but this blog post can guide you through. This entry was posted in Analysis, Data, GE2015 and tagged data, election, ge2015, googletrends, oii, oiige15, twitter, wikipedia on May 12, 2015 by Eve Ahearn.